In this tutorial, we will show you how to install Asterisk on an Ubuntu 16.04 server. Asterisk is the most popular open source software implementation of a telephone private branch exchange (PBX). It includes many features such as: voicemail, conference calling, call recorder, automatic call distribution, interactive voice response, real time monitoring, debugging console and supports most of the standard voice over IP (VOIP) protocols including SIP, d H.323 and MGCP. Current status: 7 (-2) upgradable. The command above will show no output. /usr/bin/install -c -m 0644 contrib/scripts/asterisk.logrotate.tmp "/etc/asterisk/../logrotate.d/asterisk"
That is it. The Asterisk installation is complete. 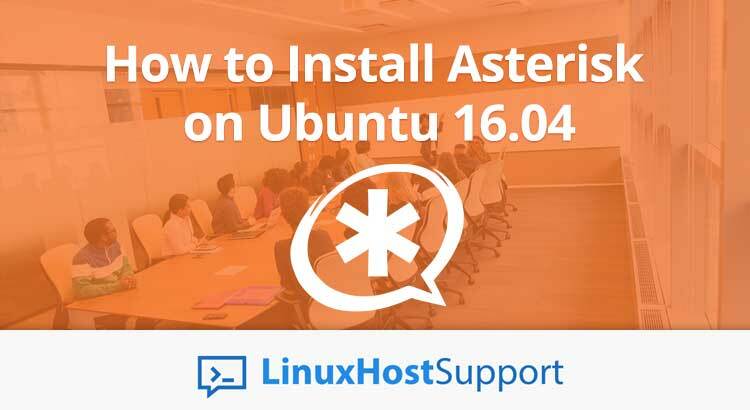 Of course you don’t have to install Asterisk on Ubuntu 16.04 yourself if you use our Premium Server Support Services, in which case you can simply ask our expert Linux admins to install Asterisk on Ubuntu 16.04 for you. They are available 24×7 and will take care of your request immediately. PS. If you liked this on how to install Asterisk on Ubuntu 16.04, post please share it with your friends on the social networks using the buttons on the left or simply leave a reply below. Thanks. At which point exactly during the installation you are getting this message? and me have the problem,you could solve this problem?